The only restriction for participation is age. A participant’s age is as of December 31, 2019. Participants MUST compete in their age group, including relays (no exceptions). Participants may only compete in ONE local meet. Participating in more than one in an attempt to qualify for State is not allowed. No spikes, turf shoes, or starting blocks will be allowed. A participant may compete in three events. This can be a combination of field and running events. The relay does NOT count as a running event and can be used as a fourth event. Participants cannot compete in three running events only (not including the relay). 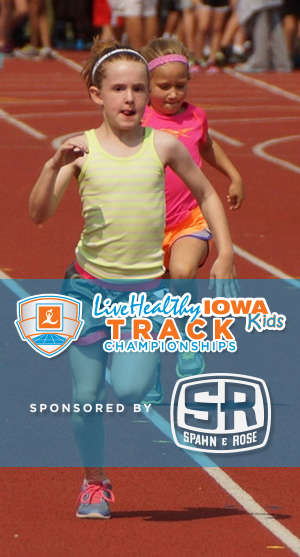 First place winners in each event and age group at every local meet qualify for the Live Healthy Iowa Kids Track Championships in Marshalltown. If the first place winner is not able to go, the second place finisher may attend. Winners must notify their local meet coordinator on their plan to attend the State meet. The local meet coordinator will then enter them in the State Meet. CLICK HERE to find a local meet near you.